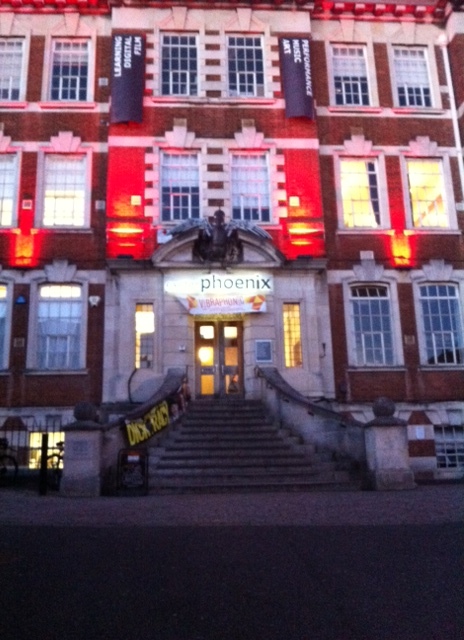 I really enjoyed reading at Uncut Poets at the Phoenix Arts Centre in Exeter last week. Before the event, my lovely friend Emily treated me to a delicious Turkish meal at the Dinosaur Café. 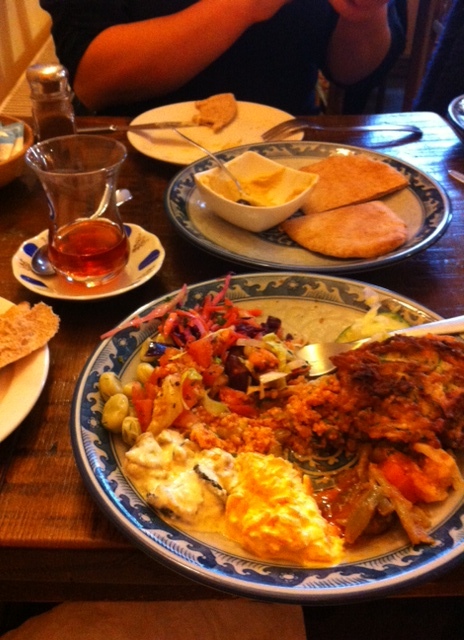 I ordered a mixed salad – one generous spoonful of every type of salad on the menu – with home-made hummus, warm haloumi cheese and pitta bread, all washed down with flavoursome Turkish tea, served in a pretty glass. The café is licensed for alcohol but I was preserving my sobriety for the poetry reading! Already quite busy with diners when we arrived early on a Thursday evening, a steady stream of customers continued to arrive as the hour progressed. It’s a deservedly popular eatery, service was fast and incredibly friendly and the menu is extremely good value for money. I can’t recommend the Dinosaur Café enough! Fully replenished, we walked the short distance to the Phoenix Arts Centre and enjoyed mingling in the bar before the readings began. It was a real treat to finally meet Anthony Wilson whose blog is a constant delight and source of brilliant information, as well as Uncut Poets hosts, poets Alasdair Paterson and Hannah Linden. I was also pleased to meet poets Simon Williams, Graham Burchell, and Clare Hepworth-Wain, and sculptor Katherine McDermott-Darley. There were many others whose names I don’t remember. Everyone was so welcoming. The evening was arranged in two halves, with an interval in between to accommodate book selling and a visit to the bar. Alasdair opened proceedings by reading a cleverly crafted and funny poem which managed to combine his admiration for Jorge Luis Borges with a story of attempting to edit an unwanted tattoo! Hannah introduced the second half by reading part of a sequence of beautiful and moving poems about the suicide of her father. There were very good open-mic offerings with each reader allocated five minutes. Reading at Uncut Poets has made me reflect on how beneficial reading series are to poets. I read from my pamphlet ‘The Misplaced House’ (and sold all ten copies I’d brought with me for which I’m grateful) and I also tried out some new, unpublished poems. It was so very helpful to introduce new work and receive a response from the audience. Like many other writers, I spend a lot of time alone. I’m not in a regular workshop group at the moment, nor am I attached to a university or writing school. I’m basically sitting at home, reading and writing, connecting with people on the internet, sending out work for consideration which is sometimes accepted for publication but more often rejected. So, although quite scary, it’s incredibly useful to get some feedback on new work. Thank you to Alasdair and Hannah and everyone at Uncut Poets. I was made to feel that I was among friends and it was a wonderful evening of poetry. Not feeling all that ‘fresh’. Sound like a great evening – the food sounds wonderful at the Dinosaur Cafe, my kind of thing. How rewarding to sell your copies of the pamphlet too. Your audience obviously appreciated your poetry, so all that time on your own writing is worth it. I’ve been reading some unpublished stuff at The Poetry Hour in Croydon. It is scary but great when you see people like it. Just go for it. So pleased you enjoyed your evening at Uncut as much as we enjoyed hearing you read. Great to meet you finally. The internet is a wonderful time machine. I missed this post completely and reading it today took me back to a wonderful evening. I enjoyed your reading so much. 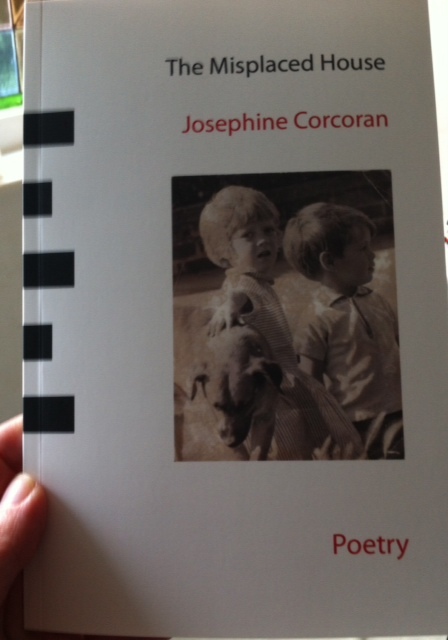 I have read and re-read your pamphlet and your new poem exploring how taboo the word suicide is (and how that isolates children affected by it) comes back to me frequently.Thanks for your kind words.